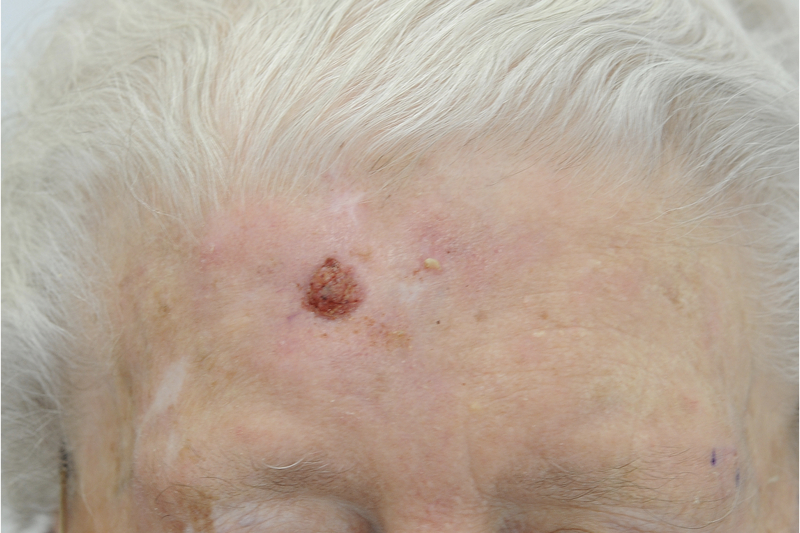 A 94-year-old woman with multiple actinic keratosis was referred to our skin cancer unit because of large, partially nodular-ulcerated and hyperkeratotic plaques on her right front (Figure 1). 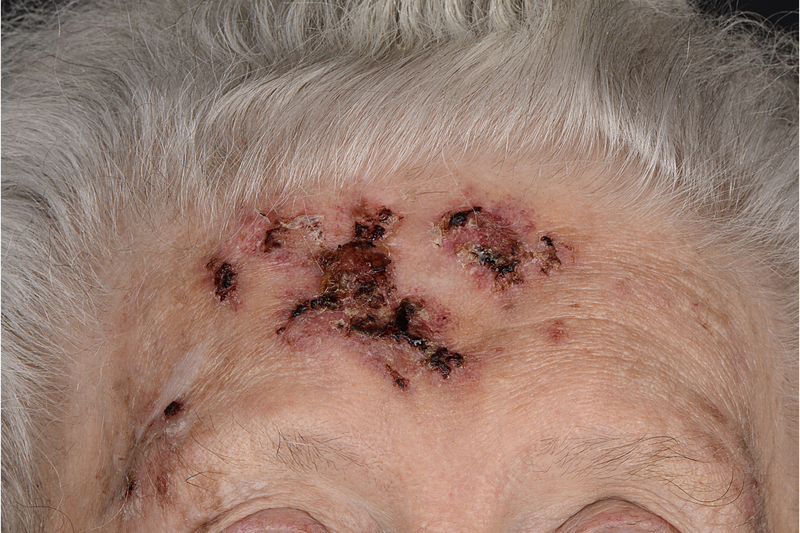 Her medical history a highly differentiated squamous cell carcinoma (SCC) on her forehead, which had been completely excised ten years before. In addition she received oral anticoagulant treatment for a deep vein thrombosis of the left lower extremity one year before. A punch biopsy was taken from the ulcerated nodule and histopathology revealed a Bowens’ disease. Based on the age of the patient and the large extend of the lesion requiring major surgery and hospitalization, radiotherapy was offered as second treatment option. However, because the patient refused both, surgery and radiotherapy, topical treatment with 0.5% 5-fluorouracil in 10% salicylic acid (5-FU/SA) once daily for 4 weeks was started. This decision was based on the combined keratolytic and cytotoxic components of the solution and the clinical features of thick hyperkeratotic plaques. The patient was scheduled for a follow up 4 weeks later. At this visit, a marked erythema, erosions and hemorrhagic crusts were observed and the treatment was stopped (Figure 2). Re-evaluation 4 weeks later revealed a marked reduction of the tumor size (Figure 3). At this stage, the patient agreed to perform a simple excisional biopsy of the residual tumor. Histopathology of the excisional biopsy confirmed Bowens’ disease with clear margins. At latest follow up, 15 months after treatment start, she was free of recurrence. In our patient, topical treatment with 5-FU/SA offered two benefits: First, we achieved a sufficient tumor reduction allowing for a simple excision. Second, it resulted in a field clearance of the surrounding damaged skin with a good cosmetic outcome despite the cutaneous local side effects after the treatment cycle. In conclusion, our case suggests that low dose 5-FU/SA may be considered a neoadjuvant or palliative treatment option for BD in a selected group of patients. Figure 2: Local cutaneous reactions of erythema, erosions and hemorrhagic crusts after application of topical low dose 5-FU/SA once daily. 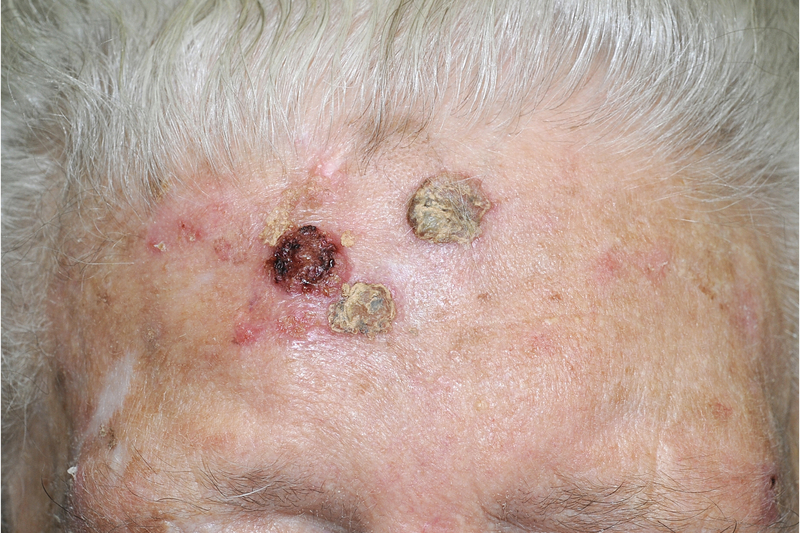 Figure 3: Clinical picture 4 weeks after treatment continuation. Only a small part of the BD remained. This was removed by simple surgical excision. Morton CA, Birnie AJ, Eedy DJ. British Association of Dermatologists’ guidelines for the management of squamous cell carcinoma in situ (Bowen’s disease) 2014. British Journal of Dermatology. 2014;170(2):245–60. Bath-Hextall FJ, Matin RN, Wilkinson D, Leonardi-Bee J. Interventions for cutaneous Bowen's disease. Cochrane Database Syst Rev. 2013 Jun 24;(6): CD007281. doi: 10.1002/14651858. Herranz P, Morton C, Dirschka T, Azeredo RR, Roldán-Marín R. Low-Dose 0.5% 5-Fluorouracil/10% Salicylic Acid Topical Solution in the Treatment of Actinic Keratoses. J Cutan Med Surg. 2016;20(6):555-561.